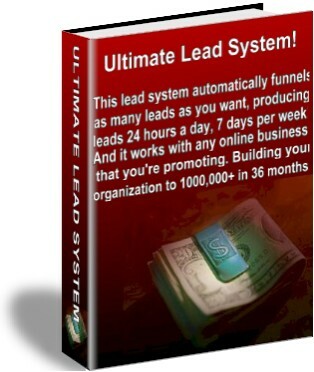 The Ultimate Lead System - The Only Lead Generating System You Will Ever Need. Today, I have some very exciting news to share with you. News that can turn you from an also-ran into a true recruiting powerhouse. But first, let me tell you what lead me to develop this amazing system. Not long ago I was just like you. I was trying everything I could to recruit new members into my organization. If it was marketing, I tried it all. Free for all link pages, e-zine ads, safe lists, web site submissions, banner exchanges, text ad exchanges, whatever. I even went out and spent hundreds of dollars each month buying leads from lead services. All of these things produced leads, but not as many as I wanted. I always had the feeling that something was missing. Something I was not doing that would produce all the leads I needed easily and simply. I even swapped opportunities a few times thinking that could be the opportunity I was involved with could be the problem. In some cases, swapping opportunities helped. But still, the problem remained. My team members would contact me wanting to know what I did to produce leads. Quite frankly, what I was doing to produce leads was beyond the abilities of the vast majority of my organization. It wasn't that they was not smart enough, they just did not have the education in web marketing or the finances to set it up and keep it going until it became productive. I needed an effective lead generating system that worked and was simple enough for anyone to set up. Then one day a friend called me. This friend is also a network marketer. In our discussion we were talking about producing leads for our opportunities. As we spoke a thought came to my mind: "I need to be in the lead generating business". If I was in that business I could supply myself and my team with all the leads I wanted. "I need to be in the lead generating business!" I spent several days downloading every e-book I could get my hands on. I reviewed them all. They all said pretty much the same thing but in different words. Submit to search engines, link with other sites, start an e-zine, run ads in e-zines, join banner exchanges, join lead expensive generating programs, etc.., etc.., etc..
All of this is great, and it does work. But the typical person can't do all of these things. It is hard enough to get downline members to do the simple tasks, you can not expect them to become web marketing experts. They will give up on the opportunity before they learn enough about web marketing to bring in a substantial amount of business.. I needed to be in the lead generating business. My team needed to be in the lead generating business. It had to be something that anyone can set up in just a few hours. On top of all that, it needed to be free. Most beginner network marketers do not have the money to keep trying programs that both cost money and don't work. I needed to offer my organization a free lead generating system that really worked! They needed to be able to generate free leads easily. These thoughts hounded me to death. How do lead companies get their leads? They set up generic lead generating pages under different URLs at different places around the web. They advertise the URLs, collect the information, and sell the leads to people like you and me. The perfect lead generating tool! Finally, I designed the only marketing system my organization would ever need. This amazing lead generating system is so simple anyone can set it up by following simple instructions. This powerful lead generating system automatically follows-up with their prospects. To top it off, this effective prospecting system earns you additional advertising, enticing even more prospects to your lead generating system. This is not a free for all links page. This is no a classified ads page. This is nothing that you have ever seen offered as a downloadable package before. This is a totally new revolutionary lead generating system! This amazing lead generating system is so effective I could not keep it to just myself and my team. I had to share it with others. Dollar signs started appearing in my head. How much could I charge people who were not part of my organization for the information detailing in simple easy to understand step-by-step instructions how to set up the system? This information is a bargain at any price! "Otis, I think you ought to give it away. You know how it is in network marketing. It is almost impossible to find any kind of lead generating system that really works. I wish I had this years ago. You could really help a lot of people." My wife was right. This is something that could really help an awful lot of people. So, I decided to offer it to the public, not for $149.95, or $99.95, or even $49.95. I decided to offer this information to the public for FREE. The total process will take a beginner no more than two hours to complete. Everything you need is included in the downloadable zip file, complete with all instructions. To get your absolutely free copy of "The Ultimate Lead System", simply complete and submit the following form. Instructions for downloading this powerful system will be immediately delivered to your mail box. By submitting the above form you are also agreeing to receive information about an exceptional home business opportunity.